The South-East Asia Bible Link reserves this page for the updates of our coming PLENARY ASSEMBLY. Kindly make your comments at the box provided for at the bottom of the page and submit it to cbfsea by clicking the “submit” button. “Let’s go to Africa” was the common cry heard at the closing of the sixth Plenary Assembly held in Lebanon. 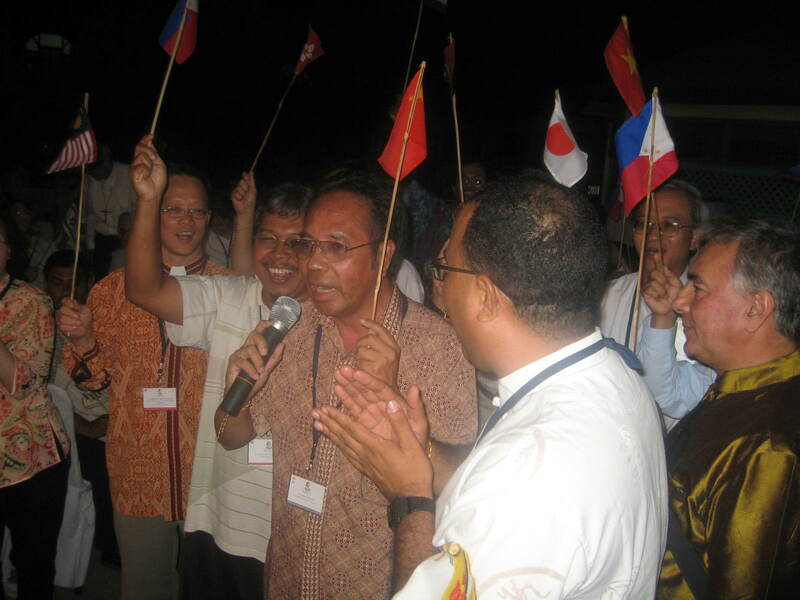 Declaring the Region of Africa and Madagascar as a major priority of the Catholic Biblical Federation for the years 2002 to 2008, we expressed our clear conviction regarding the significance of the African continent for the present and future of the Church. Having celebrated the previous assemblies in Europe (Vienna 1972, Malta 1978), Asia (Bangalore 1984, Hong Kong 1996), Latin America (Bogotá 1990) and the Middle East (Beirut 2002), our journey brought us to the African continent, which is opening itself to the Gospel with an extraordinary generosity of spirit. 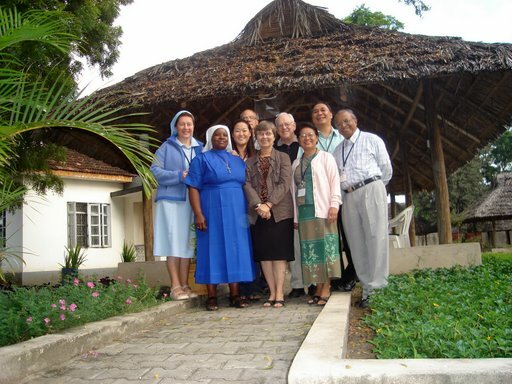 We, 230 delegates and observers from the member organizations of the Catholic Biblical Federation which is now present in 133 countries of the world, met in Dar es Salaam where we experienced the warm hospitality of the people of Tanzania and of the local Church. The message Pope Benedict XVI conveyed to us on this occasion gave us the encouragement of the entire Church. Inspired by the major pastoral preoccupation of the Church in Africa as expressed in the theme chosen for the African Synod in 2009, we decided to focus on the same topic for our Plenary Assembly and chose the theme “Word of God – Source of Reconciliation, Justice and Peace”. This theme is a major concern that is of urgent significance not only for the people of Africa but for the whole world at this time in our history. Meeting when the year dedicated to Saint Paul was inaugurated, we also drew inspiration from his affirmation that we are called to be ambassadors of Christ for the mission of reconciliation (cf. 2 Cor 5:19-20). Three years after the international Biblical Congress which the Catholic Biblical Federation organized jointly with the Pontifical Council for Promoting Christian Unity in Rome in 2005 to celebrate the 40th anniversary of the promulgation of Dei Verbum, this assembly was held on the eve of the Synod of Bishops on “The Word of God in the Life and Mission of the Church”. Having proposed such a synod since the third Plenary Assembly (Bangalore 1984), we hope that our reflections may contribute to this important event in the life of our Church and that the synod be not only informative, but actually have a concrete pastoral impact and lead people to greater participation in the Church’s life and mission. Believing in the power and effectiveness of the Word of God, that fulfills what it was sent to do (cf. Is 55:11), we came together to encounter the Word made flesh, who alone can lead us to reconciliation, justice and peace. We feel enriched by our mutual sharing in an atmosphere of fellowship and our encounters with the people from Tanzania. Listening to the Word and sharing our experiences with it in our daily lectio divina, celebrating the Word in the liturgy, especially the Eucharist, reflecting on it with the help of scholarly research and the experiences and insights of the faithful shared in Christian communities from all over the world, we want to give a personal response in our words and our deeds. In order to be faithful to our God who hears His people’s cry (cf. Ex 3:7), we tried to open our eyes to the reality of our peoples in order to perceive the lights and the shadows of human existence, in order to discern the signs of the time and respond to them. We shared several positive developments that we can see in our world, like the growing relationship among countries, the increasing awareness of the diversity of cultures, the struggle for human rights and the dignity of all human beings especially the poor and the marginalized, the growing commitment to the care for the integrity of creation and the longing for justice, reconciliation and peace. But we cannot close our eyes to the shadows that are cast over the lives of many: divisions and conflicts, violence and hatred, the abuse of religion for the promotion of fundamentalistic ideologies and terrorism, the gap between rich and poor that becomes ever wider, the suffering of so many because of outrageous poverty, hunger and diseases like HIV/AIDS, the numerous injustices and abuses of power like the corruption of governments, the uncontrolled trade and circulation of arms and the devastation of the environment. To this we may add other life-diminishing forces like consumerism, hedonism and relativism, the negative influence of the media and the fragmentation of family life. Due to worldwide terrorism the fear of the other is escalating and spreading. We are concerned with the painful situation of the Christians in the Middle East, especially in the Holy Land where many brothers and sisters endure sufferings. Among the many positive developments in our Church we would like to highlight especially the growing love for the Word of God which makes the Church more evangelizing and missionary. With gratitude we notice a real hunger for the Word of God among the simple people and the youth in many regions, the widespread practice of communal Bible-reading and the diversity of perspectives and approaches in the encounter with the Word. We also would like to mention the renewed appreciation of the Bible in the liturgy, in catechetics and in exegetical and theological studies. In many places the ancient practice of lectio divina is being rediscovered. The use of new contextualized methods for the prayerful reading of the Bible builds community. Nevertheless there are several countries where the Bible is no longer experienced as a source of life and where biblical pastoral animation is difficult and frustrating. Looking at the entire Church we realize that there are still many obstacles which prevent the Word of God from becoming the valued center of the pastoral activity of the Church: illiteracy and poverty, fundamentalism, a clericalist mentality – of priests and bishops but also among the laity – as it is expressed in a lack of interest and concern for promoting Bible-reading, and the still prevailing gap between exegesis and pastoral work which makes easy access to Sacred Scripture difficult. We deplore the paradoxical situation that the faithful’s hunger for the Word of God does not always receive an adequate response in the preaching of priests and lay ministers of the Word due to deficiencies in pastoral as well as academic preparation. We followed the example of the first African Christian as described in Acts 8:26-39. Through attentive reading of the Scriptures and dialogue with a human companion who became for him an ambassador of Christ, the Ethiopian became aware of the presence of the Incarnate Word both in Scripture and in his life. Our communal reflection, praying and sharing was inspired by Is 55 and by Mt 5–7. In our prayerful reading of Is 55:1-13 and our reflections about the text we discovered the image of a compassionate God who invites us to His banquet of love. He takes the initiative of reconciliation between Himself and His people. The creative, dynamic and sanctifying power of His Word is able to restore and transform what is devastated and broken. The renewal of the covenant between God and His people leads to reconciliation among nations and peace. As in the time of Deutero-Isaiah, God offers us also today the gift of His Word which is the source for reconciliation, justice and peace. He calls us to radical conversion of heart at all levels, to return to Him in obedience, thus making true reconciliation with others possible. Our world which longs for peace and justice can be transformed and recreated by the Word of God which is powerful and effective. It can heal the wounds of injustice and hatred and lead to new life. In a daily encounter with the Word of God we can experience its appealing force which calls us to an active engagement for justice and peace. We also reflected on the Beatitudes (Mt 5:1-12), the introduction of the Sermon on the Mount which the Fathers of the Church considered to be a summary of the entire gospel. Guided by the message of the Beatitudes as found in the tradition of our Church, in scholarly research and in the sharing within small communities in various countries, we discovered anew the powerful challenge of the Lord for the transformation of values. The Beatitudes reflect the values embodied in the Kingdom of God which Jesus Christ announced and made present through his life, death and resurrection. They express God’s preference for the poor and stand in obvious contrast to our globalized world marked by idolatry of money, power, pleasure and knowledge. Nevertheless the poor, the afflicted and those who hunger for justice are called blessed not because of their existing condition but rather because of the empowering promise of the kingdom. This promise expects from us openness of heart and mind and a generous response. A new world governed by values of justice and peace is possible if we, Christ’s disciples, are transformed by the power of his Word and strive together towards the realization of the kingdom. The work of reconciliation will be possible only if the Church imbibes the fundamental attitudes embodied in the Beatitudes. Those who live the spirit of the Beatitudes are God’s agents for reconciliation, justice and peace. They have to be aware that they can not ever escape the cross of Christ (cf. Mt 5:9). The testimony of the new martyrs of our own times, like Bishop Oscar Romero from El Salvador and the trappist monks from Algeria, shows clearly that this challenge is not to be seen in a spiritualistic way. Only a Church which does not opt for the broad and easy way of avoiding conflicts can be salt and light of the world (cf. Mt 7:13-14; 5:13-16). We make an appeal for the renewed use of the Bible for the promotion of reconciliation, justice and peace. Confronted by the Word of God, we cannot but condemn the evils that provoke violence and injustice in our world. We commit ourselves and invite others to join in the struggle for a just and peaceful world. The mandate of the Catholic Biblical Federation is the biblical pastoral ministry, providing the Church with spiritual nourishment through biblical animation so that the Word of God can be the very soul (anima) of the pastoral life of the Church. 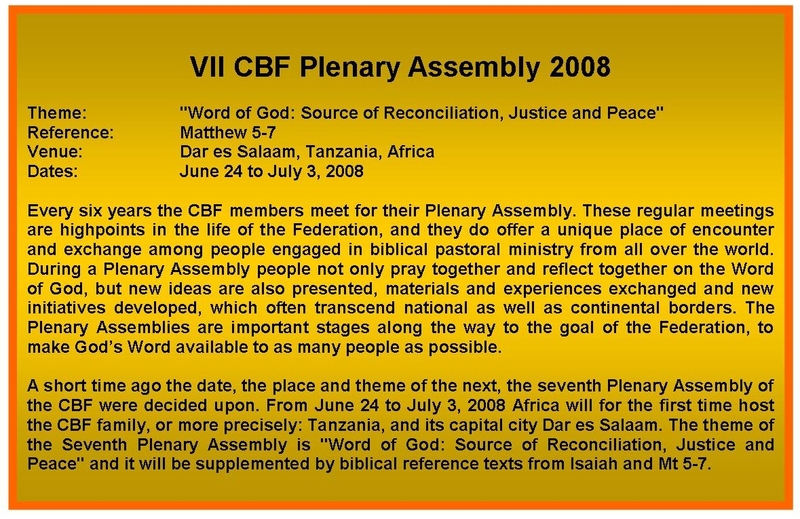 On occasion of the Seventh Plenary Assembly, the members of the CBF renew their commitment to this mandate. Our reflection during these days made clear that biblical spirituality is by no means spiritualistic but embraces human life in all its aspects. We are looking forward to the coming Synod of Bishops on “The Word of God in the Life and Mission of the Church” and support it through our prayers and the recommendations given to the members of the assembly who will take part in its deliberations. We are willing to serve the Church in the implementation of the decisions and recommendations of the synod as they will be expressed in the Apostolic Exhortation which will promulgated in its aftermath. – The biblical animation of the entire life of the Church, so that all pastoral ministry be inspired, be animated by the Word of God. 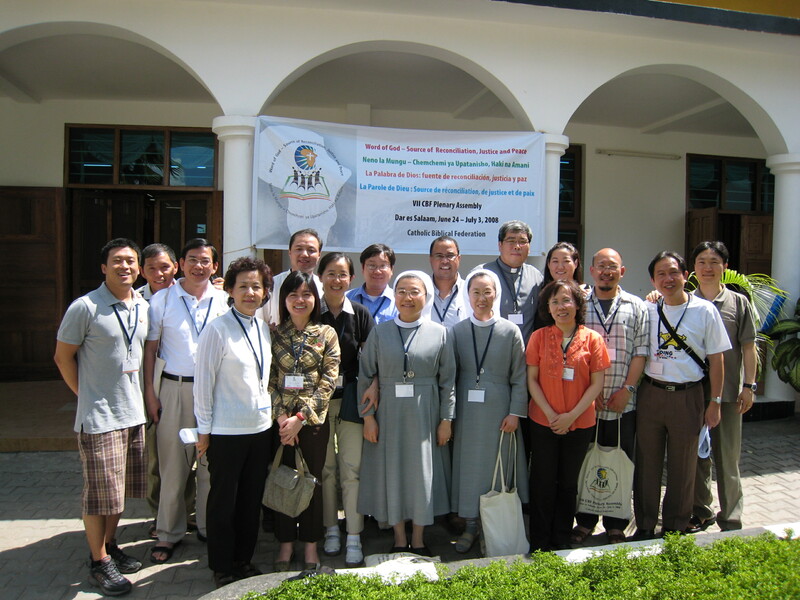 – The promotion of biblical formation of all agents of evangelization: the laity, especially catechists, religious, priests and bishops – by providing deeper knowledge of Scripture, joyful conversion to the Word, biblical spirituality with the abilities to develop creative methodologies and skills for biblical pastoral ministry. This must be part of formation programs in theological faculties and formation institutes. – The promotion of the praxis of contextualized and creative lectio divina, which can facilitate a greater correspondence between faith and life, leading to the transformation of society. – The animation of Basic Ecclesial Communities and other small Christian communities in order that they become truly the subjects of bible reading. This requires the promotion of the leadership of the laity, the deepening of the faith in the family and a special emphasis on specific hermeneutical perspectives (e.g. women, men, children, youth, indigenous and migrant ethnic groups). – The promotion of biblical animation among children, youth, and university students, in order to help them to find through the Word of God the true way to life in plenitude. – The creative and innovative use of the electronic and digital media for the transmission and dissemination of the biblical message. – The intensification of our efforts for ecumenical, inter-religious and inter-cultural dialogue and dialogue with all people of good will in view of reconciliation, justice and peace. 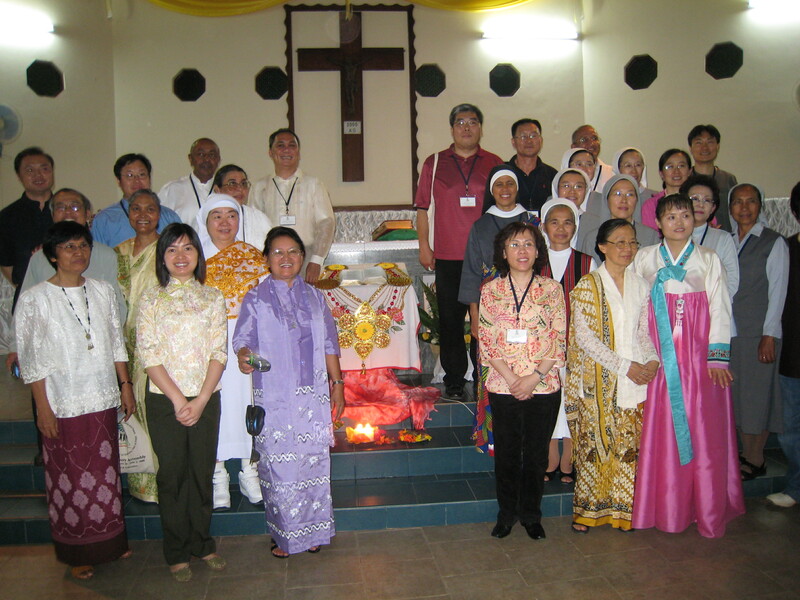 – The support of the biblical pastoral ministry in Asia with a special focus on China as a priority of the CBF for the years 2008–2014, and this in response to requests coming from Asia. – The devising of plans and methods of biblical pastoral animation in order to ensure the presence of the Word in all pastoral areas and for a better implementation of the evangelizing mission of the church. The members of the CBF should promote the incorporation of the subject “biblical pastoral ministry” in formation programs for priests, religious and laity. – The setting up of specific commissions for biblical pastoral ministry in dioceses and Episcopal Conferences where this is not yet a priority. – The promotion of biblical formation, biblical spirituality and ecumenical commitment on a biblical fundament. – Ensuring a close relationship between the Word of God, pastoral ministry and social commitment. – Searching for new forms of biblical pastoral ministry especially in those countries and big cities which are strongly marked by postmodern lifestyle, as characterized by consumerism, loss of values and fragmentation of life. – The organization of days of reconciliation that promote prayer, reflection and commitment and reading of the Bible from a pastoral, social, cultural, ecological and ecumenical perspective and the preparation of all kinds of materials related to the themes of reconciliation, justice and peace. – The strengthening of structures of coordination on the regional and subregional levels in order to further develop the network of communication, exchange and support, with the help of electronic and digital means of communication. – The pursuit of the dialogue between the Catholic Biblical Federation and the United Bible Societies (UBS) so that the Word of God might reach many people. We are aware that “if the Lord does not build the house, then in vain do the builders labor” (Ps 127:1). We commit ourselves to pray and work for the cause of reconciliation, justice and peace. We are aware that we rely on the grace of the Holy Spirit who empowers us to fulfill this urgent task of our time. In the footsteps of the disciples of Emmaus who encountered the risen Lord in the sharing of the Word and the breaking of the bread, we are convinced that the entire Church constantly needs to be nourished with the “bread of life from the table both of God’s Word and of Christ’s body” (DV 21) and try to contribute to these efforts through our biblical pastoral ministry. NB: DOWNLOAD THE WHOLE DOCUMENT IN PDF FORMAT PROVIDED BY OUR MOTHER WEBSITE [c-b-f.org] BY JUST CLICKING THIS HYPERLINKED INFORMATION. 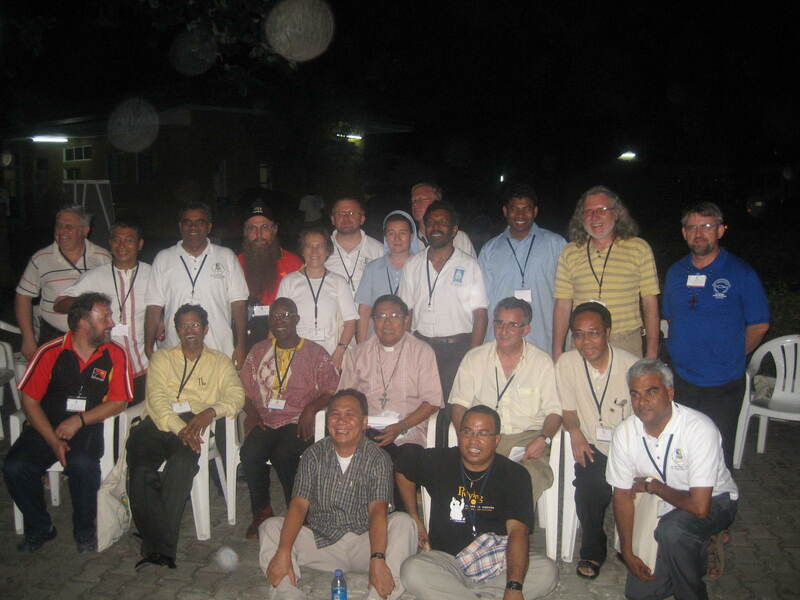 Every six years the CBF members meet for their Plenary Assembly. 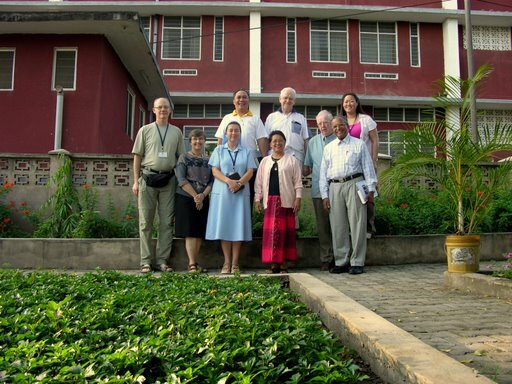 These regular meetings are highpoints in the life of the Federation, and they do offer a unique place of encounter and exchange among people engaged in biblical pastoral ministry from all over the world. 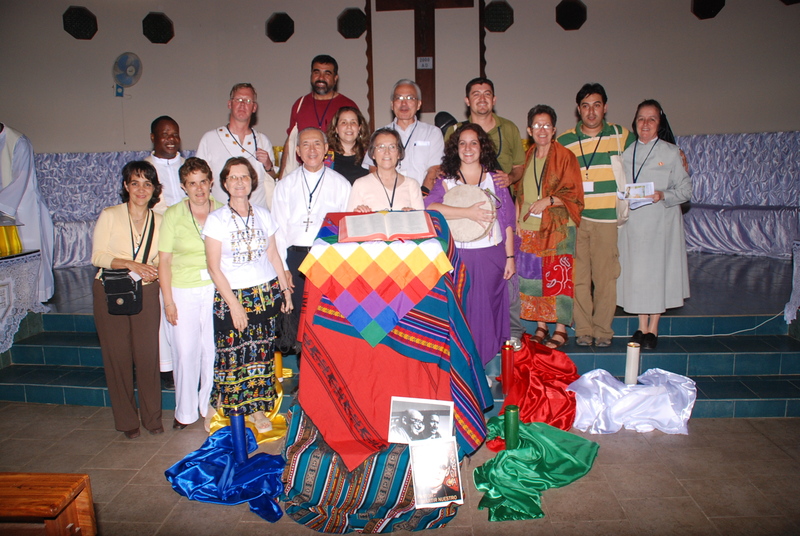 During a Plenary Assembly people not only pray together and reflect together on the Word of God, but new ideas are also presented, materials and experiences exchanged and new initiatives developed, which often transcend national as well as continental borders. The Plenary Assemblies are important stages along the way to the goal of the Federation, to make God’s Word available to as many people as possible. 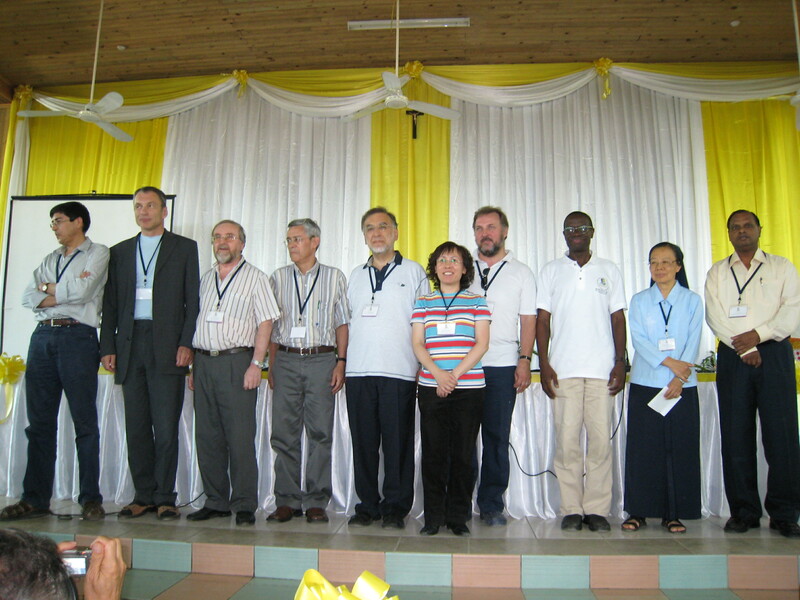 A short time ago the date, the place and theme of the next, the seventh Plenary Assembly of the CBF were decided upon. From June 24 to July 3, 2008 Africa will for the first time host the CBF family, or more precisely: Tanzania, and its capital city Dar es Salaam. The theme of the Seventh Plenary Assembly is “Word of God: Source of Reconciliation, Justice and Peace” and it will be supplemented by biblical reference texts from Isaiah and Mt 5-7. Attached please find again (CLICK THIS: members-1_2007_e.pdf) the letter by the CBF General Secretary of August 2007 which you have already received, together with the Lineamenta and the new CBF Brochure, by mail.